Thanks for reading this page. My goal is to give you some insight on me, the shop, my motivations, and what’s important at the shop. I guess it all started when my wife and I moved to Lyons when I was working for Schwinn in 2000. Lyons is an amazing town on the front range of Colorado. It’s small but has a huge quality of life, especially for a cyclist. We are surrounded by great riding, both mountain and road. I was racing semi pro mountain bike at the time. Living in town and spending a lot of time pedaling the area and it wasn’t long before I had completely fallen in love with Lyons. Lyons was a great place to live and to ride. About that time, Schwinn went bankrupt a second time and I landed another job a bit further away at Pearl Izumi. It was great being in the bike industry, and PI has been an amazing company to work for but when my oldest daughter was born in 2003 I took a long hard look at life and re-evaulated my priorities. I was spending too much time in the car and away from my family. 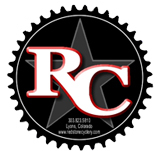 I started Redstone Cyclery in late 2003 as a home business. Outside of my family, there is nothing in the world that means more to me than cycling. Redstone started as a way to follow my passions, my dreams, and support myself at the same time. I was tuning up local bikes and strictly doing labor jobs. Word of mouth spread and it quickly became more than a side business to make money. I opened the shop (the world’s smallest bike shop) on the corner of 4th and Broadway in downtown Lyons in November of 2004. Having a family and a mortgage, though, meant that I still was working at PI a full time schedule. The shop opened officially on weekends and by appointment. Over the course of the next few years, business flourished and the shop grew quickly. Some days were hard, working all day at PI, then working until 2am at the shop, but the reward of a job well done is intoxicating. With the support of both my family and Pearl Izumi, I took the PI job from full time to part time early in the summer of 2004. The bike shop has continued to flourish and is doing better than ever. Shortly after splitting duties between Redstone and PI, the bike shop weened itself from the corporate teet and has been flying solo since. In late 2010 we moved to downtown Lyons, to 355 Main Street. The shop is bigger and better, but our attitude hasn’t changed. “Local” customers stop in from Laramie, WY all the way to Colorado Springs. We’ve been working diligently over the past years to spread the love of bike culture and it’s working. We have new trails being built, attitudes changing, and more cyclists everyday. Word has spread about the Lyons’ best bike shop, and our customers and supporters are all over the country. Redstone is now a world wide top 20 Turner dealer and a top 30 Intense dealer. It’s come a long way. Stay tuned and stay in touch. Exciting things are on the horizon!